A new procedure for the cure of congenital talipes varus and equino-varus. Fitzgerald, Sir Thomas Naghton (1838-1908). Description : 316-321 p., [7 l.] pl. ; ill.: 5 phot., 4 engr. ; 25 cm. Photographs : 5 albumens mounted to 5 printed leafs. Photographers : Johnstone & O'Shannessy & Co.
Subject : Foot — Congenital talipes equinovarus. Author caption: By T. N. FitzGerald, F.R.C.S.I., Senior Surgeon to the Melbourne Hospital. Cited: Sayre, L. A. & Sayre, R. H. (1891), Orthopædic Surgery. New York etc. : Annual of the universal medical sciences, vol. iii; p. G-9. All photos captioned: New Operation For Talipes (Mr. Fitgerald's Paper). Photo caption 1: John B., æt 6., Before Operation—Had Never Walked. Photo caption 2: John B., æt 6., After Operation—Stands And Walks Well. Photo caption 3: R. C. And A. C.—Before Operation. Photo caption 4: R. C. And A. C.—Before Operation. Photo caption 5: R. C. And A. C.—After Operation. 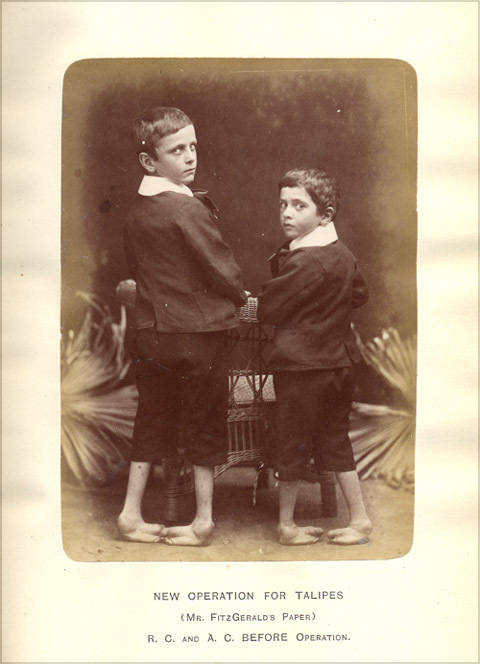 Out of many cases, I select for illustration the photographs of two brothers, Robert and Alfred C., aged respectively 8 and 6. They were admitted to the Melbourne Hospital, and operated upon in the manner described. The photographs speak for themselves. Before the operation, the feet were turned so that the boys walked entirely on the outer side of them, and ambled about with the peculiar gait and roll which are seen in all cases of aggravated equino-varus. They left the hospital within two months of the operation, walking on the soles of their feet, as shown in the photograph.—Page 320. Lewis Sayre was so impressed by Fitzgerald's radical procedure, that he included much of this paper in an article printed for Sajou's Annual, omitting the photographs but including the engravings of appliances. At a time when most surgeons practiced conservative tenotomy in the treatment of club foot, Fitzgerald demonstrated the benefits of a chisel and mallet freely applied to the bones of the tarsus and the astragalus. The first two plates are of a 6 year-old male subject, before and after his surgery for club foot. The following three plates represent two barefoot brothers before their surgery—viewed from the front and from behind—and a third plate showing the boys after their surgery. All subjects are standing. Pictorial elements and props are the same found in other portraits made by Johnstone & O'Shannessy, the leading commercial photography studio in Melbourne until 1893 when it folded. The firm's namesakes, Henry James Johnstone (1835-1907) and Miss E.F.K. O'Shannessy, had long departed the business by the time these images were made.